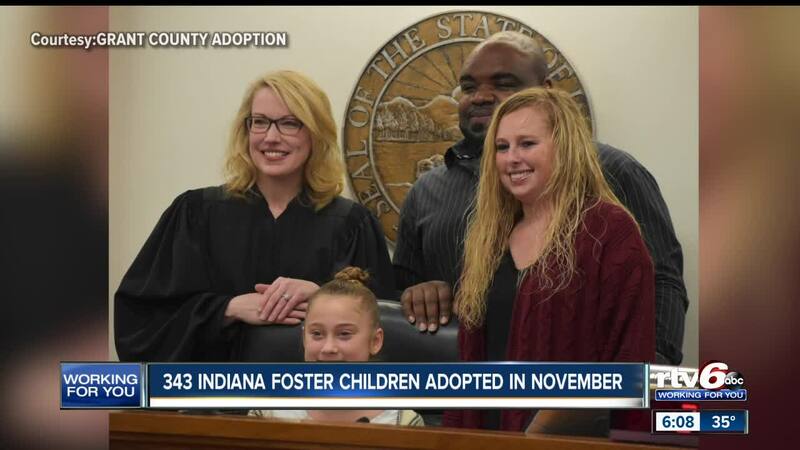 343 FOSTER CHILDREN NOW HAVE PERMANENT, ADOPTIVE HOMES, THANKS TO DOZENS OF SUCCESSFUL NATIONAL ADOPTION MONTH EVENTS ACROSS INDIANA IN NOVEMBER. INDIANAPOLIS — It will be a Christmas hundred of Hoosier children, and their new families, will nevr forget. 343 foster children now have permanent, adoptive homes, thanks to dozens of successful 'National Adoption Month' events across Indiana, in November. In the video above, there are pictures and videos of new happy families from events in Grant county. There was an adoption increase of 23 percent from last year, during the same adoption month celebration.